"Marines, the Prophet of Truth doesn't know it yet, but he's about to get kicked right off his throne. You will take our city back. And drive our enemy into the grave they've been so happily digging. One final effort is all that remains." The Battle of Voi, also called the Siege at Voi and the Third Battle of New Mombasa, was an engagement between the UNSC-Sangheili alliance and the Covenant in the Tsavo region in and around the town of Voi, Kenya on Earth in November 2552. It was the last engagement in the Battle of Kenya at the close of the Covenant's invasion of Earth. Since the arrival of the Jiralhanae-led Covenant occupation fleet on October 20, 2552 and the following days, the Covenant had occupied the entire region between Mombasa and Voi. Their goal was to uncover a Forerunner artifact, the Portal which led to the Ark. The Covenant fleet consisted of twenty-eight CCS-class battlecruisers and two CAS-class assault carriers. This was a dark time for the UNSC; earlier in battle, Covenant infantry and vehicular detachments had overwhelmed ground-based UNSC defending forces, forcing them to retreat from the area, taking heavy casualties in the process. The situation in orbit was similar; the Covenant loyalist ships greatly reduced the UNSC Home Fleet, already weakened by the initial attack. Despite several UNSC counter-attacks before the final battle, the Covenant had been gaining more and more ground in Eastern Africa, and thoroughly occupied Voi. The last UNSC stronghold in the region was a recently re-purposed 20th-century base, Crow's Nest, located 14km away from Voi. This was where the remaining UNSC forces in the area were coordinated. After Commander Miranda Keyes, Sergeant Major Avery Johnson and Arbiter Thel 'Vadam arrived at Earth from Installation 05, Commander Keyes assumed command of the base. Prior to the UNSC assault on Voi, there were several skirmishes between the UNSC and Covenant forces some distance away from the city, as the UNSC regrouped and formulated their plan to assault the Covenant's excavation site. They eventually managed to make a hole in the Covenant perimeter defenses at the Tsavo Highway, the primary route to Voi. A Pelican in the hangar of Crow's Nest. Shortly after John-117 was recovered, following the events of the Raid on Kilimanjaro, the Arbiter and Sergeant Major Avery Johnson arrived at the base and began to discuss plans for attacking the Prophet of Truth's army at the Forerunner structure. The Prophet sent a transmission announcing his plans to destroy them and launched a massive assault on the Marine base. The UNSC forces, spread thin, fought against the Covenant forces in order to hold them back long enough to evacuate the wounded. The Chief, alongside with squads led by Gunnery Sergeants Reynolds and Stacker, led a strike against the bulk of the invaders while Johnson and the Arbiter guarded the ops center. The Chief soon had to return to the ops center, as the Jiralhanae were attacking it. He swiftly defeated the invasion and learned that Keyes had ordered the massive bomb planted, which would explode and set off other charges in the base, obliterating it and all Covenant within. The Chief then had to go with the Arbiter to rescue Marines trapped by the Jiralhanae in the barracks before the Jiralhanae killed all the prisoners. The Chief and the Arbiter rescued as many Marines as they could and had Hocus evacuate them (and the rest of the UNSC forces still there) via Pelican. The Chief then fell back to the ops center to defeat a Jiralhanae force that had taken it over and deactivated the bomb. The Chief reactivated the bomb and retreated, barely escaping as the bomb went off and killed the remaining Covenant. The battle on the Tsavo Highway. UNSC forces led by John-117 and Gunnery Sergeant Reynolds, a small amount of Marines who survived the battle of Crow's Nest unscathed, escaped the ruins of the complex in Warthogs to avoid Jiralhanae who would inevitably search the remains of the base for survivors. While escaping, they helped a group of Marines near the base's entrance who were pinned down by Covenant scouts. The survivors were unable to send transmissions, but they were able to receive them. They were ordered by Miranda Keyes to go to Voi and assist Marine forces there, who were battling the Prophet of Truth's troops. John-117 and the Marines traveled along the Tsavo Highway, battling Covenant troops in the shadow of the skeletal remains of the Mombasa Tether. Nearby, Gunnery Sergeant Stacker led a convoy bringing supplies to the exhausted troops at Voi, but they were ambushed and strafed by Banshees. John-117 and the Marines with him were able to reach the convoy and rescue the survivors. They were finally able to communicate with Miranda Keyes, who was told by ONI Recon 111 that the Prophet of Truth was excavating what they surmised to be the Ark. With the help of resupply Pelicans sent by Sergeant Major Avery Junior Johnson, John-117's convoy was able to punch through to Voi. After his battle to fight his way up the Tsavo Highway, John-117 not only secured the gate to Voi but also a landing zone for Commander Miranda Keyes to deploy her Marines. Mounting up with a group of Warthogs, he rode to the gates outside of the Traxus facility where previous Marine counterattacks had failed. Ten marines dismounted from the Transport Warthogs along with the Chief and then a few remained to operate their Warthog LRV to give them heavy support. After initially infiltrating the facility the first gate was opened, interrupting a file of Kig-Yar and Unggoy during one of Truth's speeches via a portable holo-pedestal. They were taken by surprise and quickly eliminated. After fighting through another file of Unggoy, the Chief opened the door to a long tunnel heading down the facility. A large group of Unggoy, Kig-Yar and a single Jiralhanae Captain guarded the other end of the corridor, along with their reserve Ghost RAVs. After the combined arms of the Chief, the Warthog and the Marines defeated the defenders, they finally broke through to their first objective. In the dried out dockyard outside, the first Type-52 Anti Aircraft Artillery lay, lending its weight to an aerial dogfight between Hornet Gunships and Banshees. It was guarded by a trio of Ghosts and numerous Phantoms came in to cover the ground forces. The UNSC forces punched upwards, securing a UNSC held dock office after initially being pushed back from it and used the LAU-65D/SGM-151 SAM turret at the base to beat back Covenant armed forces. After destroying their objective they pushed onwards, destroying the Wraith that defended the doorway back into the Traxus facility. Inside, the UNSC forces still held parts of the facility but were being pushed back by an assault being headed by a Jiralhanae Chieftain. In there, a Marine fire team operating an AIE-486H Heavy Machine Gun held the Covenant at bay, at least for a time. A Marine squad headed by John-117 pushed in and killed the Chieftain and his bodyguards attempting to oust the Marine defenders. After opening the next bulkhead for the Warthog they were ambushed by a swarm of Yanme'e that descended from a Phantom overhead. After forcing them into a retreat the Master Chief and the Warthog linked up with a Marine anti-tank unit armed with M41 rocket launchers that had requisitioned four M274 Mongoose ULATVs to use as improvised fast-attack light anti-armor vehicles. A Marine offered Spartan-117 the controls of his Mongoose and he led them out into the next dock. In the next dry dock a pair of AA Wraiths battered UNSC air forces, and had a significant amount of defensive measures compared to the last area. A number of Ghosts and Chopper RAVs defended against UNSC counterattack. The Marine mounted anti-tank unit, the supporting Warthog LRV and a number of troops defending the actual dock with conventional arms and a series of SAM turrets. Covenant forces were beaten back and their AA batteries destroyed but they refused to admit defeat, bringing in Ghost reinforcements on Phantoms. They were all defeated in turn, leaving the UNSC forces a respite and a chance to bring in more mounted anti-tank units before the Covenant gave one last push to retake the dock. A Type-47B Scarab was deployed engaged the mounted forces in the dock. The Marines had a choice whether to disable its legs to cripple it and bring it low then board and destroy its power core or to buy time for the Master Chief so he could use one of the dock cranes to board it. In time, it was defeated and destroyed, giving the UNSC forces breathing space to make their push for the final objective. The Master Chief soon traveled up to the dock and was joined by another squad of reinforcements led by Thel 'Vadam and moved through to another section of the Traxus facility. This section served as the Marines' local command center, their medical station and ammo dump. It was heavily fortified with numerous defensive points armed with machine guns, but at the other end of the base, where it entered the warehouse, their defensive position was falling. Jiralhanae forces had pushed back through the warehouse, flanking their defensive position. UNSC forces, now joined by Voi dock and factory workers and led by the Arbiter and the Chief soon pushed back, retaking the warehouse and defeating large groups of Jiralhanae and a Mgalekgolo pair before a showdown with a Chieftain outside. After more tight street to street fighting, they pushed the Covenant forces back to the rocky precipice where the AA gun lay. With no way for the Jiralhanae to retreat and with Lord Hood's attack imminent, it was make or break time. UNSC forces pushed up the hill, fighting off another War Chieftain, numerous Unggoy and Kig-yar, the Chieftain's pack and several hastily planted plasma cannons. After defeating the forces guarding it they destroyed its rapidly overheating core and cooling system to cripple it and waited as Lord Hood's attack commenced. A task force of three frigates, including the UNSC Forward Unto Dawn, and Longsword fighters assaulted the Forerunner Dreadnought sitting in the center of the artifact. Multiple MAC rounds and fighter-launched ordnance proved ineffective. The Dreadnought suffered no apparent damage and it proceeded to activate the artifact. Covenant forces quickly departed through the newly-created slipspace portal. Another unexpected event soon manifested in the arrival and crash landing of the Indulgence of Conviction in Voi. Although it was initially thought to bear Jiralhanae reinforcements, it soon became apparent that it brought Flood instead. The infected battlecruiser slips in. The victorious UNSC forces were now encountering unknown hostiles all over the town and they splintered, as their weary forces were no match for the parasite. The Flood had found their way to Earth and rapidly begun to spread. Commander Keyes gave a single order, fight to the core of the ship and overload its reactors, which would destroy the ship, the city, and any Flood in the area along with it. Master Chief and the Arbiter headed back into the town to outside the warehouse facility to see the true face of their enemy. A pair of retreating marine fire teams were ambushed by combat forms and infection forms, leaving their infection as inevitable. 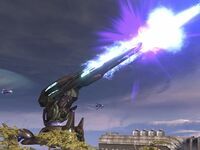 John-117, the Arbiter and the survivors had to inevitably turn their guns on their former comrades. After pressing through the warehouse, they linked up with more survivors and pressed on. The route to the command center had been closed off so now they had to find another way around. Using fusion cores as improvised explosives and an M7057/Defoliant Projector as an ad hoc anti-Flood weapon, they circumnavigated the bulkhead and entered the unusually empty command center. Encountering a single, delirious survivor, the UNSC forces continued to push to the downed ship to meet their new allies. The Sangheili Fleet of Retribution had followed the Flood-infected ship from their blockade at Delta Halo to its arrival at Earth. They began to drop Sangheili forces to push towards the ship, seeking a prize that lay within it. It wasn't until they came back into the Traxus facility that the Sangheili told the UNSC that they believed the AI Cortana was within the downed ship. The Sangheili and the Master Chief eventually reached the crash site. With the remaining forces giving cover to the Chief, he entered the Flood controlled ship and retrieved Cortana. After the remaining troops were evacuated safely, the Sangheili glassed the infested land, sterilizing the area and effectively ending the Battle of Voi. UNSC and Sangheili leaders convene aboard Shadow of Intent. A simulation of Earth being infested by the Flood. Following the battle, UNSC and Sangheili military leaders held a meeting aboard the Sangheili flagship Shadow of Intent. There, what was initially thought to be Cortana turned out to be a message from her. The message warned the UNSC and Sangheili that the Gravemind itself was coming to infest Earth aboard the former Covenant holy city High Charity. The recording also informed them that beyond the Portal was a means of stopping the Flood without firing the Halo Array. The Sangheili opted to go through the Portal after Truth, but Lord Hood wanted to stay to defend Earth, despite the Sangheili's insistence that Earth could not survive a full-scale Flood invasion. The Master Chief, however, convinced Hood to allow the UNSC's remaining forces to accompany the Sangheili through the Portal to both stop Truth and find Cortana's solution to the Flood. Hood remained behind to coordinate Earth's remaining defenses. Though the Battle of Voi concluded with the end of the Covenant presence in Africa, remaining loyalists had fortified themselves across the southwestern URNA. The Prophet of Truth and his fleet's departure through the Portal sent the Covenant battlenet into disarray, allowing UNSC forces to enact a major counteroffensive in Arizona, which set the stage for eliminating the Covenant presence on Earth once and for all during Operation: MARSH FLASH in early December. The Flood threat to Earth was neutralized, but only after the area surrounding the Portal had been glassed. Hood's expected Flood invasion never came; the following day, the Gravemind had High Charity perform a Slipspace jump from the vicinity of Mars to the Ark instead. At some point following the battle, the UNSC performed biohazard containment protocols in what remained of Voi—now dubbed the "Voi Exclusion Zone"—as part of Operation: JOINT MONITOR to ensure no Flood presence was left; none was detected. After the Human-Covenant War, the UNSC concealed Voi's glassing as a surprise attack by the Covenant, although some humans outside the UNSC, such as Staffan Sentzke, knew the truth about Voi's glassing. The arrival of the Flood on Earth also made the UNSC realize the full extent of the threat posed by the parasite; the UNSC concluded that if the Covenant had not glassed Voi, Earth would have fallen in hours. After the creation of the SPARTAN-IV Program, the UNSC began to develop training simulations for the Spartans, and create technology against the Flood, in the hypothetical case of the parasite returning to threaten the galaxy. The first objective in sight. John-117 and his backup fight through the Traxus facility. One of the AA Wraiths is destroyed by Marine forces. Sierra-117 regroups with Marine forces. A group of Marines outside the Factory Complex. The ruins of New Mombasa are visible from across the crater. A Scarab deployed into the lakebed. The UNSC Forward Unto Dawn fires on the Dreadnought. The Dreadnought right before the opening of the portal. Concept art of ODSTs facing the Flood in Voi.